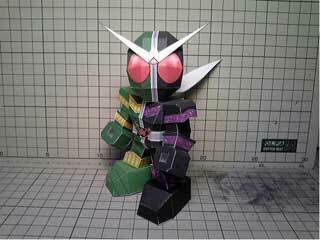 Half green, half black, meet KK-factory's Cyclone Joker papercraft based on the 2009 Kamen Rider series "Kamen Rider Double ". Kamen Rider Double features two people that can transform into a single-body Rider (hence the split color), a first in the Kamen Rider series. Special thanks to KK for the link.